Tis such a special season! T'was the night before the night before, the house is filled with guests. A very special time of year, I love the carols, the lights, being warm and cozy by the fire. Sharing with friends and family, it is all about the feelings. A brand new life opened up before me this past year, I am forever grateful. It has been so busy with all of the renovations but it is wonderful to see it coming together. A new home, a new venture, a special new love, how amazing life is! May your holidays be special filled with love and joy! This time of year the music, the carols are so beautiful! For the library tree I wanted to include some antique music ornaments. Using Taupe Rit Dye I immersed sheets of Christmas music bought on sale at a local music store into a shallow dye bath. Removing them quickly, I popped the sheets in the microwave for a few seconds. Each sheet was cut in half and rolled into a cylinder, glued. The edges were spread with glue and sprinkled with tinsel glitter for a continued antique feel. 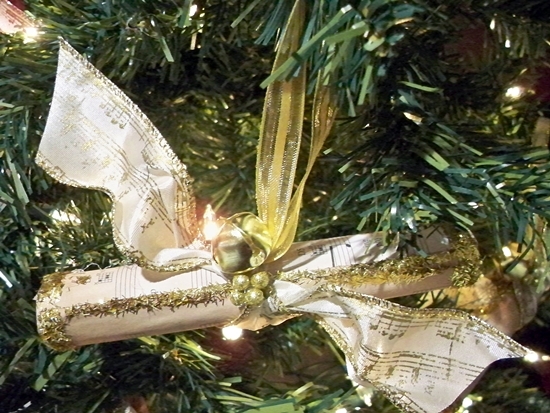 A ribbon hanger, a piece of music ribbon was tied around and a jingle bell added. The results a pretty ornament, quick and easy to make. I am adding them to my gift packages tied from the bows. DCC Hop Gifting & Wrapping! It is the first Monday of the month and the Designer Craft Connection is hopping with great gift ideas! Gift giving also means gift wrapping. Recently I had a group of friends over to gift wrap presents. I like to co-ordinate wrapping with the Christmas decor of a home. Adding some fresh pine gives it a fresh look and of course the smell is wonderful! 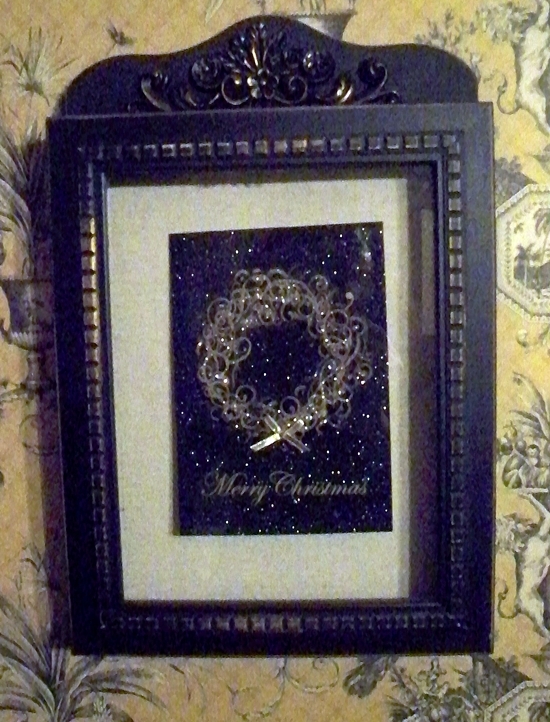 A shadow box I found on sale was glammed up with some gold Rub n' Buff and I added a sparkly Christmas Card to the center of the box for an elegant holiday greeting. After the holidays the box can then be filled with whatever the recipient would like. 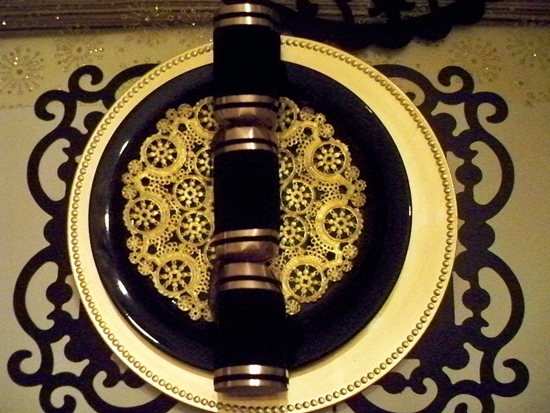 Place settings can be put together very inexpensively and given as gift to be used for New Years. I purchased dishes on sale, place setting of four for less than $20, the chargers were only $3 for the set of four, twelve foil doilies $1, six placemats $6 and the crackers were $1 each. For about $35 I put together four festive place settings. A black gift box tied with gold ribbon will be the wrap for this stylish gift! Hop along with the DCC button in the sidebar to be inspired by thirty plus talented professional designers! Happy Hopping! A Christmas Miracle at QH! The past few weeks have been filled with renovations as I embark on a new venture. I love my design work but also love to decorate interiors and entertain, to provide an experience, to make my guests feel welcomed and special. My design skills enable me to create original design elements for my interiors. After I return from the CHA winter show in Anaheim in January I will be opening a bed and breakfast here in picturesque Frederciton, NB, Canada. We will have three guest rooms at Quartermain House. 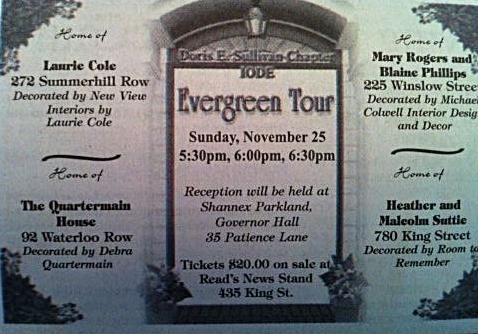 Sunday evening Quartermain House was on the annual IODE Evergreen Tour where four homes are decorated for the holidays and 300 tickets are sold for guests to tour the home. The renovations experienced some delay so were not finished before tour, the great crew working here finished up on Wednesday at 5pm. This is how the place looked then. I had four days to decorate the house from top to bottom. Several friends who came by did not think I could do it. I had doubts myself for a brief time but being a creative eternal optimist :) I had to make it happen! Mostly working around the clock by noon on the 25th the foyer now looks like this! In two weeks 300 guests will tour four beautiful homes decorated for the holidays. This has been a tradition in Frdericton for almost thirty years. This is the IODE's main fundraiser of the year and the funds are used to support school programs, charities and scholarships throughout the year. I love the holidays and decorating. I had always wished one day I could have a house on the tour and this year it has come true! Although the house has been under renovation for the past month I am excited to deck the halls for the big event! I have decorated one of the mantels for the morning for an article to appear in the local paper Wednesday. As I put out the lights and glittery accents the warmth and excitement of this special time of year, the magic just happens! This year this beautiful home will be filled with lights, with holiday magic and most importantly with family, friends and love! This month's theme is thank you gifts. November marks the beginning of the holiday season, invitations to holiday parties, gatherings, gift exchanges. My favorite thank you gifts to give are handmade ornaments. I design and create new ones each year. 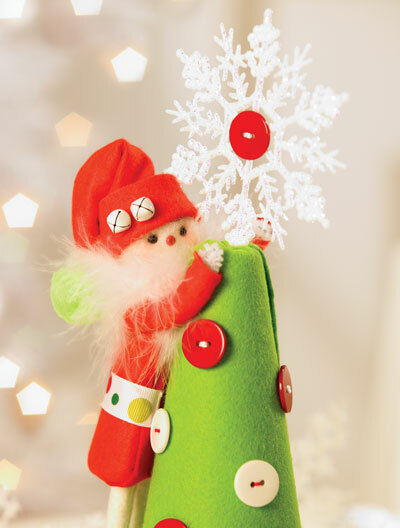 One of my favorite designs is this whimsical elf popping out of a stocking. 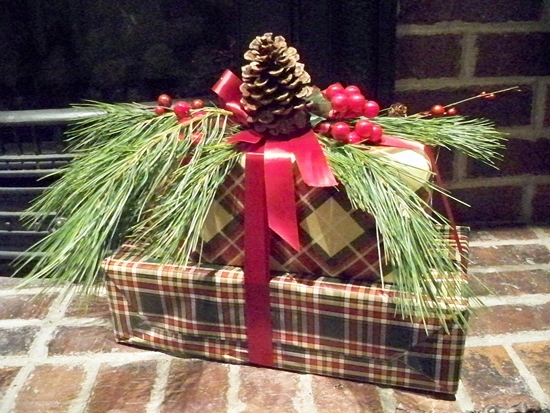 I create them in different color combinations to match the gift recepient's holiday decor. 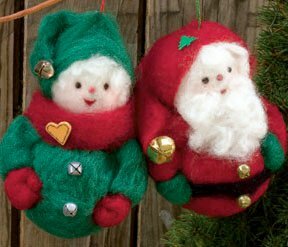 The elf's head is a needle felted 1 1/2" Styrofoam brand foam ball and the stocking is made National Nonwoven's wool felt. The scroll design on the stocking die cut with the Sizzix Big Shot. It cuts felt beautifully. 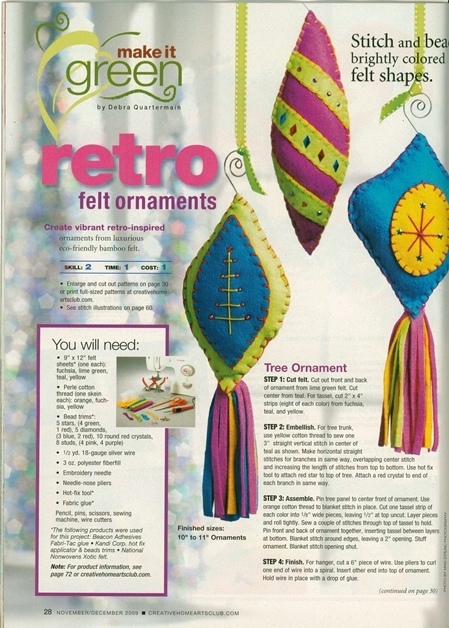 Bead and button embellishments complete the ornament. Be inspired with the projects offered by the other members of this talented designer group, just hop along with the DCC button in the side bar! 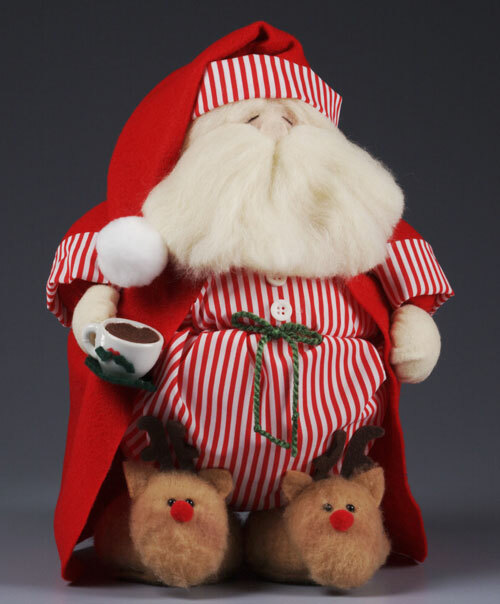 One of my favorite designs I created for Styrocrafts was Santa the day after his big night. (full instructions available on site along with many more great projects) Sleepy in his robe and reindeer slippers, I often wondered if he was making any New Year Resolutions or just simply enjoying the last few days of the year reflecting, remembering and enjoying! Resolutions, intentions, reflection on the year past. All I know is living with love and integrity, celebrating and sharing joy is the path I travel. Our hearts are bumped and bruised along the way but oh so much more fills them with deep love and strength. My darling daughters hold my heart, my love's reflection, a special one has danced into my heart and life is good! 2012 holds much creative adventure ahead! To all of you who take the time to visit, to read and comment, a sincere thank you from the bottom of my heart. May 2012 be filled with what brings you joy always! 'Tis the season of celebration & decoration! The St. Mary's Reserve located on the North side of our city always puts on a spectacular show, home after home twinkles with a vast and varied collection of color, movement and characters. Part of the holiday tradition is to drive slowly through the area and enjoy the show. This year I was able to take a few half decent pictures. One of the homes of a school bus driver even had the bus decorated! Traditions hold the true meaning of this season, year after year we cherish those special times, remembering the years past adding a new collection of memories to join the album of our lives. Each year I see my daughters a little older but still delighting in the moments we continue to share, the annual gingerbread house creation, favorite holiday movies, John Denver and the Muppets playing Christmas morning. I cherish these moments tightly knowing there will inevitably be change. As we celebrate another year, the third in yet a different place still it is home for it is the place our hearts dwell. Enjoy the lights, the traditions of the season you share with those you love. This time of year is busy trying to fit everything in, all the extra shopping, decorating and of course crafting! This is an easy inexpensive arrangement using a vase flowers came in and burlap from the hardware store. I painted the vase green with acrylic paints, wrapped it in burlap. Country check fabric was stiffened with a white glue mixture (2 parts water to 1 part glue, hang to dry, iron and cut) to make the ribbon. Add a raffia bow, wood heart and pop in branches and berries. A perfect hostess gift! It is Fowl Friday with Fran & Freda! Tis deck the halls season, we love it! BUT there is a BIG problem! Owls have invaded once again, how Debra can let in these dangerous birds we do not understand! We were here first, not that it seems to matter anyway a small consolation is that one of them is wearing a very silly looking hat, the other a scarf maybe it means they are the outdoors type. Perhaps they might enjoy the balcony, on a permanent basis. hmm I have an idea...Debra is away all weekend at the 37th Annual Arts & Crafts Show so we will be in charge and home alone, the ideal combination! Look out owls, this is one feisty fowl!!! Handmade gifts are always special. A gift created with love, time and caring hands. The gift is filled with a loving energy between both the giver and the receiver. 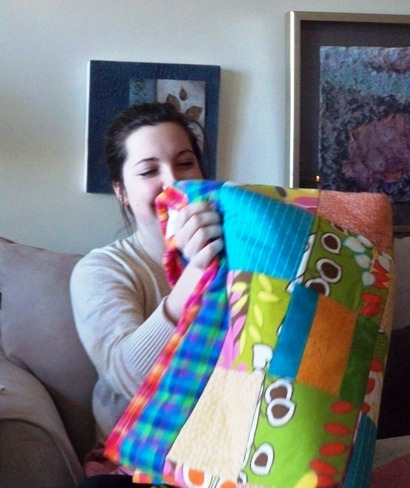 This year I made a quilt for my youngest and pillows, wall hanging for my oldest daughter. Other gifts they received were also handmade by the most wonderful artists. Both girls are so appreciative and it was a cherished morning Christmas Day opening gifts, laughing and loving! The holiday weekend was a very special one with both of my darling daughters here. The annual gingerbread house creation is always so much fun. The themes are unusual and would not be my choice but the laughter, creativity, candy and time together is priceless. So this year a tribute to a show they both watch "Teen Mom" and the house a Teen Mom Spa & DayCare. A path of candy lego blocks and soothers with a brown sugar sandbox! Okay, the front of house I "helped" with, got a little messy! Just a fun time had by all! Follow the Joy always! Debra, CEO! 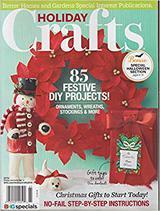 The Holiday issue of Create & Decorate features a cute pair of characters I designed using STYROFOAM TM. 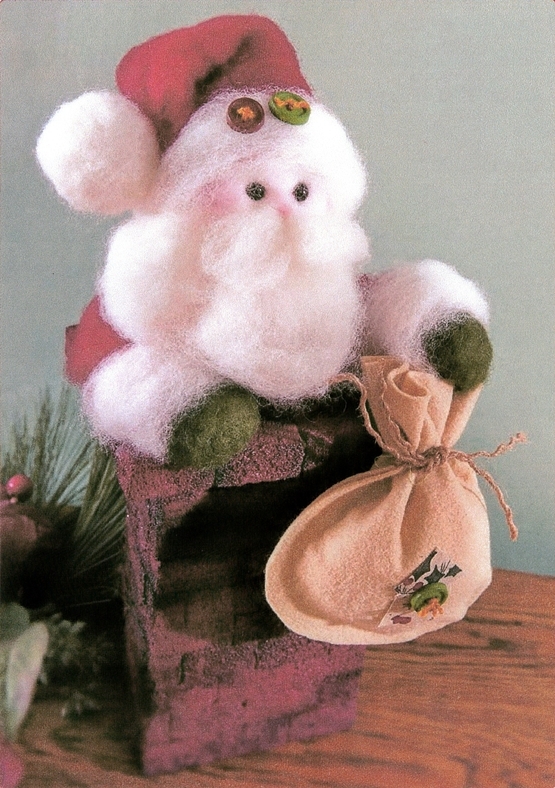 I love creating needle felted winter and holiday characters. The soft wool from National Nonwovens adheres so easily to the foam shapes using Clover's pen needle tool. Preparations are almost all ready around here which is hard to believe! My first Christmas with my daughters living away and coming home. The oldest arrives today. Kate has been busy baking and enjoying just hanging out with me! It is such fun to have her here! Here she is in my little kitchen making cookie dough truffles for gifts! Having my youngest daughter back home is beyond wonderful! She just turned nineteen and has been away at school. I became and empty nester six months ago when both daughters left. Sold my house and followed my heart to a new place. To have her back makes home once again, the favorite ornaments on the tree, familiar and loved carols playing through the sparkling lights. My other daughter arrives in a couple days, the place will be filled with laughter and love! The annual themed gingerbread house will be constructed, favorite holiday movies to watch, games and goodies. Christmas morning we spend time oohing and ahhing over each gift, savoring the time spent together, of gifts chosen and created with loving care. These are indeed special times, moments that capture the heart forever. To my darling daughters, my sweet chicks who have left the nest but not my heart, I love you! Follow the JOY! Debra, CEO! Decking the Halls! Countdown to Christmas!!! I love this time of year! Preparing for the holidays and my darling daughters arrivals! Last minute gifts underway. My favorite design work is using STYROFOAM brand foam products and felt. I created this cute scene for a quick centerpiece, perfect for the Fave Crafts monthly blog hop this month! It is also featured in the Homearts newsletter the Creative Buzz. Full instructions are on the website. Ho! ho! Ho! Enjoy the season! 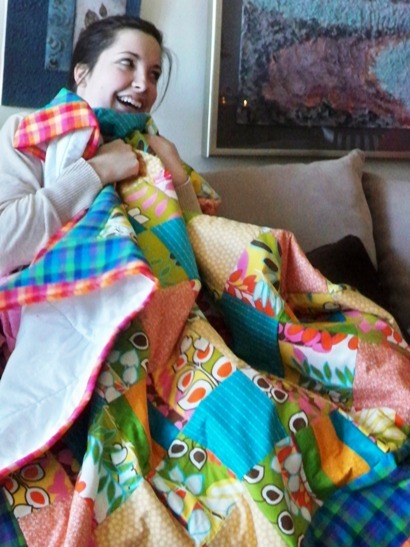 Tomorrow the Sizzix Triple Play blog hop continues. Follow the JOY!!! Debra, CEO! A winter wonderland has surprised my world through the night. This snow is official, here to stay and tonight the colored lights and eyes everywhere will sparkle. I love to decorate in harmony with the seasons, a collection of snowmen, snowflake pieces, reindeer sculptures and trees will keep the place cozy and reflect the snowy view outside. This is a very different holiday season for me, it will be the first one in which my daughters do not live with me but both will come home for the holidays. It is in a new place, a new city but it is still home. They will create their annual themed gingerbread house, play games, cook, watch favourite holiday movies, shop, laugh, hug, talk and cry together. They are amazing wonderful young women pursuing their dreams, warm, funny, kind, smart, responsible, have all the qualities you could possibly want your children to have and they are happy above all else. I love my girls in a way that is fierce and proud, in awe of who they have become and who I have become because of them. I wait for my daughters to arrive filling the place with surprises, decorating & remembering as I unwrap their stockings, the cherished ornaments to hang. So as I decorate my new place I have a huge tree, a gift in the sunroom foyer entrance and with my love of birds and several bird cages I decided to use one as a tree top. I am also creating two love birds to sit atop the cage but they are not quite completed. I fastened the cage securely and then decorated around it. 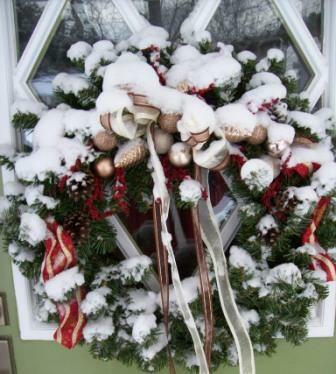 Using what you have as part of the Holiday decor is always a fun and easy way to decorate. Follow the JOY! Debra, CEO! Valentine's Day is this Sunday, I have always loved Valentines whether I had a special Valentine of mine own or not. I always had my darling daughters and with February mid winter, cold and snowy a brightly festive box decorated with hearts and filled with surprises brightened the month. Now they are fully grown with their own special Valentine's and I have a very special one of my own they are happy to have the box retire. Makes me a little sad but I know down the way there will be a new generation of little ones who will love the Valentine Box! 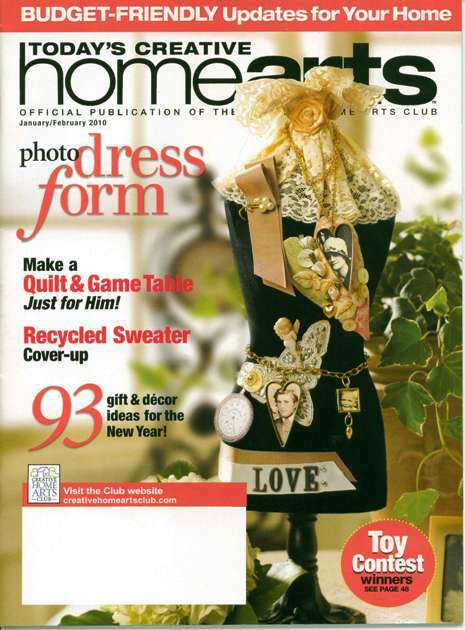 The January February issue of Creative Homearts magazine features a Valentine keepsake on the cover which I created using Nunn Designs beautiful pateras. It is always exciting to be a cover girl! This piece features family photos and vintage buttons, lace remnants. I think special days that remind us of who we love and give us a chance to show our love are important. Yes we want to do that everyday but something special and unexpected, a surprise, a token of love always touches the heart. It does not have to be expensive or take a lot of time but a handmade card, heart shaped cookies or a simple "I love you" note tucked into a pocket or lunch bag is a reminder of being loved and cared about. All anyone really wants is to be loved and cherished, to know they matter and are cared about. I have always believed that "Life is simply a love story!" Always Follow the JOY! 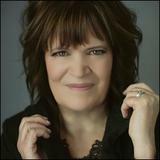 Debra Quartermain CEO! JOY is the Season Always! 'Tis the Season is heard often these days when we turn our minds and hearts purposely to giving and sharing. The music, the lights and the messages are everywhere. I know for many it is also a time when loss is felt more keenly, stresses financially and others to perform and do so much this time of year can be exhausting. We can not do it all or make the Holidays for others by over extending ourselves in any way. This year will be my first Christmas without my Mom, I have spent every Christmas with my Mom my entire life and find myself forgetting, the pink sweater I saw the other day she would have loved. (the pink thing is indeed hereditary!) I miss her dearly but remember how much she enjoyed the Holidays last year in her new apartment with us. She loved to sit with the music playing and the fireplace glowing. My oldest daughter is off to ski for the Holidays with her wonderful birth family so my youngest and I will celebrate here a little differently. No tree this year for the first time but with two kittens probably a good thing! The place is still decorated and the girls are making their traditional non traditional Gingerbread House this week. (This year's theme a homage to Michael Jackson's Thriller, always a challenge to fit it into the decorating scheme!) We are not having turkey instead a yummy seafood casserole. I have also someone special in my life now and part of my holidays will be elsewhere. So the season like life itself changes and the emotions are a mix as well. That is life and in life the sorrows allow us to also know and appreciate true JOY. Each morning I put on the twinkling lights around the house and the Holiday music, I sing and dance (great aerobics!) around the house with each window a wintery masterpiece of snow covered trees and sparkly land. What anyone really wants is connection, compassion and caring, the gift of another person whether with a visit, a call, a card that expresses the importance of one for another. We never know how long we are meant to be here, may those we love know always how much they mean to us. Make this a season of love, love messages from the heart that is the JOY of the season! Follow the JOY always! Debra, CEO!